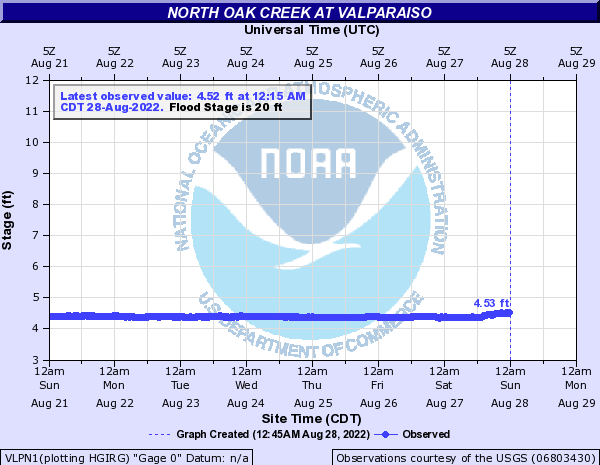 USGS Current Conditions for USGS 06803430 North Oak Creek at Valparaiso, Nebr. USGS 06803430 North Oak Creek at Valparaiso, Nebr. Downstream view from USGS gaging station: North Oak Creek at Valparaiso, Nebr. Add up to 2 more sites and replot for "Gage height, feet, [From Auxilliary Stage Gage]"
Add up to 2 more sites and replot for "Gage height, feet, [From Primary Stage Gage]"